Great scales for less! High quality and economical! These scales are easy to use and portable! Quickly weigh anything with a push of a button! Upgrade your kitchen today! Chef Prep Tables are on sale, click here! Click Here for way cool SS Lab Tables! 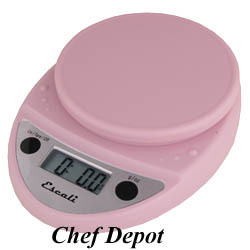 These digital scales are economically priced and very easy to use with its two-button operation. 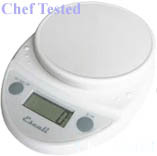 Capacity: 11 Lb or 5 Kg, Measuring units: Ounces and Grams. Dimensions: 8 in. x 6 in.x 1.25 in. (21cm x 15.5cm x 3cm), Resolution of 0.1 ounce or 1 gram increments for accurate measurements. Tare feature subtracts the containers weight to obtain the weight of its contents. Compact and portable for easy storage or transport. Automatic shut-off feature ensures long battery life. Two AA batteries are included. 5 year warranty. Includes easy-to-use operations manual including food codes. Choose from Chrome, White or Black below! Video review is below. 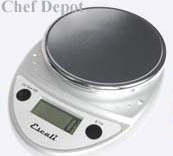 The Escali Alimento series digital scales are equipped with highly accurate durable sensors and are perfect for kitchen, office and laboratory use. 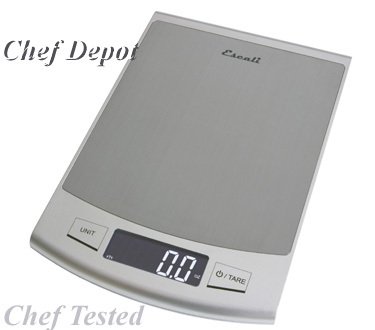 The scale features a removable stainless steel platform, a big display and easy touch buttons. A professional scale for the no-nonsense professional. Capacity 13.2 Lb or 6 Kg, Measuring units: Pounds, Ounces, Kilograms and Grams, Dimensions 9.75"x7.00"x3.75" (24.5cm x 18cm x 9cm). Resolution of 0.1 ounce or 1 gram increments for accurate measurements. Hold feature displays the weight of an item after removal from scale. Tare feature subtracts the container's weight to obtain the weight of its contents. Automatic shut-off feature ensures long battery life. High quality construction - spill proof design. Stainless steel removable top makes clean-up fast and easy. Includes easy-to-use operations manual, One heavy-duty 9V battery is included, 5 year warranty. Includes easy-to-use operations manual including food codes. This is our new digital nutritional scale, it's a scale with a smart weighing system inside. This highly diverse diet scale has easy to use features to display Portable Nutrition Tracking. The Ultra Slim OCesto portable nutritional scale allows the user to have access to weight and nutritional data at home and away. The user friendly touch glass display shows calories, sodium, protein, fat, carbohydrates, cholesterol or fiber via the input of 999 different food codes. It can calculate total nutritional value for up to 99 different meal components. Measure Nutritional Content. Measure calories, sodium, protein, fat, carbohydrates, cholesterol and fiber content of food based on weight measurements for 999 of the most common food items. Add Nutritional Measurements Together. Calculate total nutritional values of multiple food components with the memory recall feature. Touch Sensitive Controls. The touch sensitive controls create a single, smooth glass surface which is easy to keep clean. Liquid Measuring: Measures both liquid (fl oz, ml) and dry ingredients (g, oz, lb + oz). Tare Feature : Reset the scale to zero weight to measure multiple items or subtract the weight of container. Automatic Shut-off: The scale will turn off after four minutes of inactivity to help conserve and extend battery life. This is our new digital nutritional scale, it's a scale with a smart weighing system inside. This highly diverse diet scale has easy to use features to display nutritional values, including carbohydrates, fat and protein. It will prove to be an indispensable tool in your health conscious way of living. Capacity is 6.6 Lb or 3 Kg. Measuring units: Pounds, Ounces, Kilograms, and Grams. Dimensions 8.5"x8"x2", Resolution of 0.1 ounce or 1 gram increments for accurate measurements. Tare feature subtracts the container's weight to obtain the weight of its contents. Displays Calories, Sodium, Protein, Fat, Carbohydrates, Cholesterol or Fiber via the input of 999 different food codes. Calculates total nutritional value of up to 99 different meal components. Automatic shut-off feature ensures long battery life. High quality construction - sleek and modern design. Removable stainless steel plate for fast & easy clean-up. One heavy-duty 9V battery is included, 5 year warranty. Includes easy-to-use operations manual including food codes. Our new stainless steel digital scale is sleek and compact. A multifunctional scale that measures liquids, and solids. Also has user friendly touch sensitive technology, and a crisp reverse LCD display to provide easier readings. Features:Automatic Shut-off feature ensures ultra long battery life (lithuim batteries included). Crisp reverse LCD display improves visibility. Measures both liquid (fl, oz, ml) and dry ingredients (g, oz, lb + oz). Sleek and stylish design, modern stainless steel surface. Fast Tare feature: subtracts a container's weight to obtain the weight of its contents. Easy-to-use operations manual including food codes. Increments:0.1 ounce, 1 gram, Capacity:22 lb / 10 kg. Product Dimensions:9.5" x 6.5" x 0.75" in thick (24cm x 16cm x 2cm) Warranty:Lifetime Limited Warranty. Measuring units:ounces, lbs + oz, grams, or fluid ounces, milliliters. Video is below. 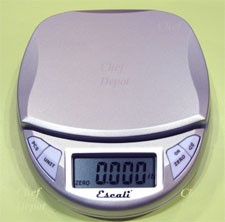 A Chef tests out the digital scale. Click Here for handmade Japanese Chef Knives! Some of the items used in the kitchen are New Razor Sharp Chef Knives! Notice, the knife is very sharp and cuts very easily. A sharp knife is required by every Chef and Gourmet cook. These cuts will take you practice to master. Chef is using one of our NSF Stainless Steel Tables! 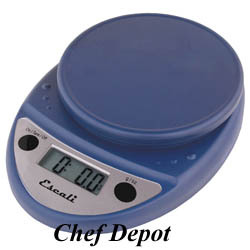 These digital scales are economically priced and very easy to use with its two-button operation. Capacity: 11 Lb or 5 Kg, Measuring units: Ounces and Grams. Dimensions: 8 in. x 6 in.x 1.25 in. (21cm x 15.5cm x 3cm), Resolution of 0.1 ounce or 1 gram increments for accurate measurements. Tare feature subtracts the containers weight to obtain the weight of its contents. Compact and portable for easy storage or transport. Automatic shut-off feature ensures long battery life. Two AA batteries are included. 5 year warranty. Includes easy-to-use operations manual including food codes! Click Here Manual Knife Sharpeners! Click Here Electrc Meat Slicers! Weigh Your own Luggage. Never pay overweight bag fees again! 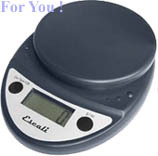 This a high quality luggage scale features easy, 1 button operation, stainless steel clasp, and a tough nylon strap. Mfr. 5 year warranty. 110 lbs or 50 kilograms. Tare Feature lets you reset the scale back to zero. When using a container, scale can subtract the containers weight to obtain the weight of its contents function. Automatic power off. Data lock feature, Over load indication, 1 lithium battery is included, Dimensions: 6 in. x1 in. x1.25 in. (15 cm x 2.5 cm x 3 cm) Colors may vary. Includes easy to use operations manual! Click Here for the finest USA made Cutting Boards! Our Mercado series dial scale features accurate measuring in an environment where a digital scale is not essential. 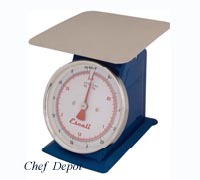 These durable spring scales have a metal frame, clear read out and stainless steel bowl or optional platform. This scale is 22 lb., 1 oz. increments, large pan holds up to 2 quarts or more of your ingredients. Available in a variety of capacities. Call for large quantity orders and other styles. Mfr. 5 year warranty. The Mercado series dial scales feature accurate measuring in an environment where a digital scale is not essential. 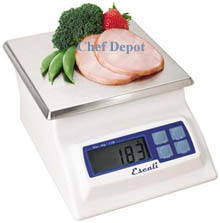 These durable spring scales have a metal frame, clear readout and flat stainless steel platform. Available in a variety of capacities below. Capacity (with increments) choices (22 Lb or 10 Kg, 1 oz 50 gr, 44 Lb or 20 Kg, 2 oz /50 gr), Shatterproof dial cover with stainless steel ring, Dual read out in Metric and Imperial, Rotating Tare feature, One (1) year limited warranty. Chefs Note: We love the rotating dial for the TARE feature. It is handy when portioning steaks or chicken breasts. Chef Tools for Less! Chefs across america use our products! Chef Knives are on sale!